Playing position Attacking Midfield, Central Mid. Anderson Hernanes de Carvalho Viana Lima (born 29 May 1985), known as Hernanes (Brazilian Portuguese: [e&#641;&#712;n&#592;&#771;ni&#643;]), is a Brazilian professional footballer who plays for Serie A club Internazionale as a central midfielder. 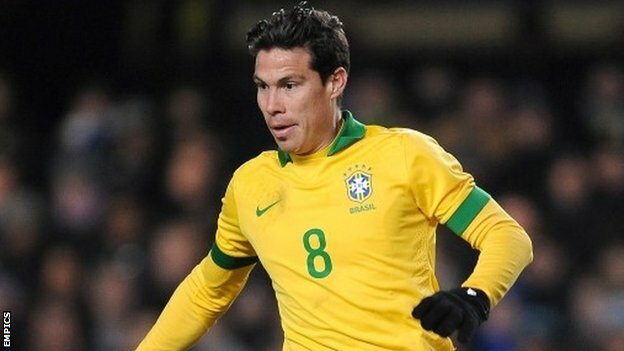 Born in Recife, Hernanes is a product of the São Paulo academy and played for them for 9 years (2001–2010). He was loaned out to Santo André for the 2006 season. In 2008, as a São Paulo player, Hernanes won the Prêmio Craque do Brasileirão's best player award. In January 2009, Hernanes was listed as the most promising football player in the world by the British newspaper, The Times. On 31 January 2014, Hernanes joined Internazionale, completing a permanent switch from Lazio by signing a four-and-a-half-year contract that runs until 30 June 2018. Hernanes can cover all midfield positions. He is well known for his technique as well as being neat and tidy in possession, with the ability to accurately pass the ball out wide in order to stretch play. His double step is one of the most popular in the world and he also is an accurate and powerful striker of the ball. He has been compared to Andrea Pirlo and Kakà. At least change the picture with a Brazil one. No weaknesses. Il nuovo Messi. It'll be funny trying to offload him in the coming windows. Was about to comment on that. Nope, he will revive his career like Pirlo with us.